For obvious reasons I’ve been thinking about the White House, Presidents and Inaugurations. What will be the outcome of the next few years? Will there be catastrophic change, is the nation on the cusp of national renewal or will the nation slog on in a malaise? Each President attempts to make his stamp on the nation and the world. This is always the case, even when it comes to the White House’s lawn and gardens. The illusion that is created by the grounds at the White House is of a small, open forest and not a formal garden. Each tree is carefully placed as not to block vistas but rather frame and create them. Each tree is placed so as to have its full impact, whether its main attraction will be in the fall of the year for color or in the winter of the year with stately branching or as a backdrop and as a shelter to other parts of the garden. But I want to stress here that each tree is carefully placed. It may look like a natural setting, but it is otherwise. There are few places in the world more carefully planted. Each new planting must take into account what is already there as well as its impact on the future landscape. One of the most famous trees on the White House grounds is the Southern Magnolia, Magnolia grandiflora. The magnolia that stands out the most is the one on the south side of the White House that was planted by Andrew Jackson (a fiery populist if there ever was one). It is a grand, great and glorious tree, very fitting to Andrew Jackson’s memory. I have a picture of it in front of me right now. The glossy green foliage silhouetted against the White House is almost perfect in its horticulture elegance. The milky white blooms also silhouette themselves against the white structure like the white on white patterns of lace. Our familiarity with the Southern magnolia has bred contempt. People call this a “trashy” tree. I suppose, if you have one planted in your yard and you have trimmed it up and are trying to grow a lawn under it, it does seem trashy. It does need picked up after, for it drops spent leaves a good part of the year. The solution to this is to let it grow close to the ground and leave the leaf litter under the tree, not even attempting to grow a lawn underneath it. But I think calling the magnolia a “trashy” tree is one of the saddest horticulture attitudes in the South. Rather, we should be proud of this great tree; it’s a bit of “horticulture Americana”. In Europe it is one of the most highly valued of our American trees, and it’s only fitting that they are planted at our White House. Our out-going President and his wife Michel Obama are now famous for planting a vegetable garden out in the White House lawn. Jimmy Carter planted vegetables before them during his four years in office and Eleanor Roosevelt planted a victory garden during World War II. But what is next for The President’s Park? Time will tell. People magazine quoted Mr. Trump last year as saying “If I were elected I would probably look at the White House, and maybe touch it up a little bit…But the White House is a special place, you don’t want to do much touching.” Maybe a single tree as iconic as Jacksons’ magnolia will be planted. Time and history will tell. 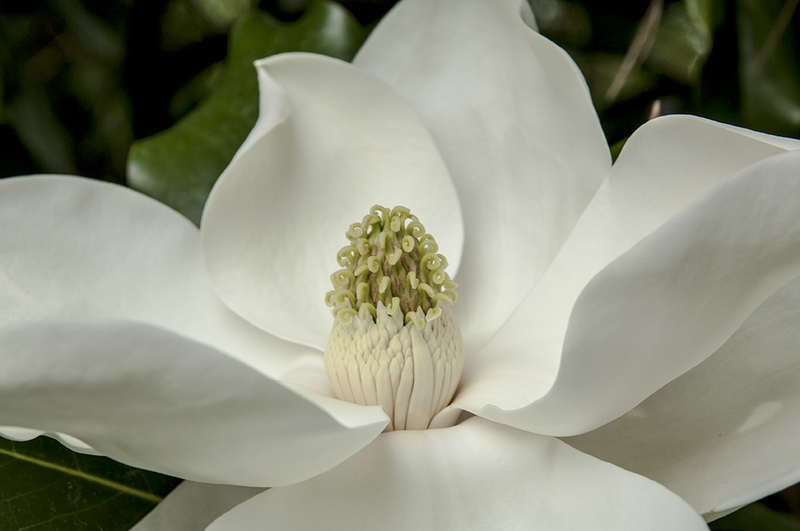 The bloom of the Southern magnolia is iconic at our nation’s White House. This entry was posted in Gardening, Leica, PICTURES AND GARDENING by Jeff Abt. Bookmark the permalink. Thanks Dawn…I think “Garden and Gun” is a fine publication!